A solver deals with numbers, so you'll need to quantify the various elements of your model -- the decision variables, the objective, and any constraints -- and their relationships. Start with the decision variables. They usually measure the amounts of resources used (such as money to be allocated to some purpose) or the level of various activities to be performed (such as the number of products to be manufactured, or the number of gallons of a chemical to be blended). 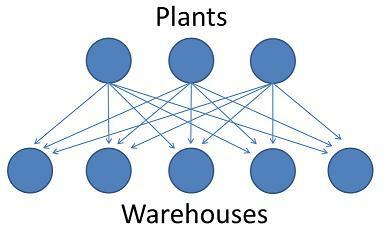 For example, if you are shipping products from 3 different plants to 5 different warehouses (as shown below) there are 3 x 5 = 15 different paths along which products could be shipped. So, you would likely have 15 decision variables, each one representing the amount of product shipped from a particular plant to a particular warehouse. Now, suppose each plant produces 4 different product types and you want to determine the optimal shipping plan in each of the next 6 months. This might lead to 3 x 4 x 5 x 6 = 360 decision variables. This simple example illustrates how a model can become large rather quickly. So part of the art of modeling is deciding how much detail is really required in a given situation. In some cases, an optimization model is defined completely by its decision variables and objective. However, most optimizations problems involve constraints that restrict the values the decision variables can assume and, in turn, the objective value that can be achieved. < Back to: What Must I do to Use a Solver?